VARIO system: adjust the tension of the cables as per your needs. Diameter 120 cm. See exercise in black and white; with JUMPGA’s striking monochrome rebounder. IN THE ABSENCE of colour, it takes creativity to make something truly interesting. 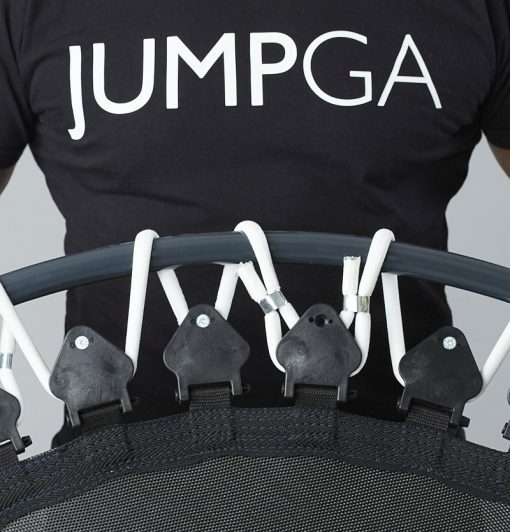 The JUMPGA programme is a minimalist training creation that you can follow on a striking monochrome rebounder. JUMPGA is a pioneering hybrid exercise programme has been tried and tested by top athletes and deemed hard to beat! It combines Jump Training with Yoga Flow: an easy way to get fit. The adaptable cardio movements can be either High Intensity Interval Training (HIIT) or Low Intensity Interval Training (LIIT), each followed by a toning series of Yoga movements. ‘Namastè’ to that. If you are looking to build up your fitness, JUMPGA is a great way to do it. 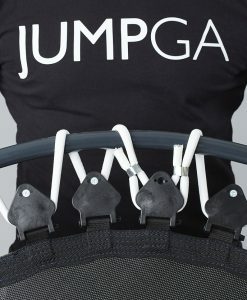 If you haven’t exercised in a while, JUMPGA is a great place to restart. It works no matter what your reason! Since it places minimal stress on your body, you can complete the exercise session several times a week at home, on your own rebounder. 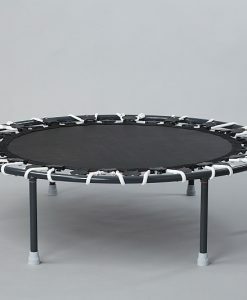 Increase or reduce the tension of the trampoline according to your individual needs! VARIO is a new suspension and tensioning system with 12 individual rubber cables. This allows you to set the tension of the elastic mat to tighter or softer depending on your needs, without having to replace cables or rubber rings. Each individual special suspension offers 4 different tensioning options for changing the degree of softness. And you can adapt the tension with a few easy steps, on just a few or on all of the 12 separate rubber cables. The more of them you change, the greater is the effect on the tension of elastic mat a whole. Depending on your individual preferences, your body weight or the kind of training you wish to perform. For you and all of your family. The specially coated, very durable rubber cables have a very high extensibility and elasticity. 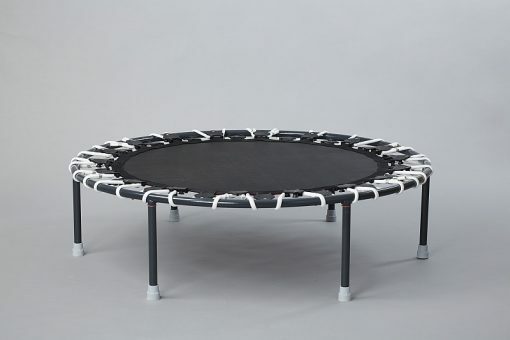 This provides superb bounce quality and active-dynamic rebound combined with a great deal of fun. With just 1 meter in diameter it provides a suspension just sufficiently tight to support a normal jogging frequency, while the special rubber cable is a bit softer than the springs suspension of the Trimilin-med.